Richard ‘Bert’ Roberts, Vladimir Uliyanov and Maxim Kozlikin (clockwise from top) examining sediments in the East Chamber of Denisova Cave. Institute of Archaeology and Ethnography of the Siberian Branch of the Russian Academy of Sciences, author provided. 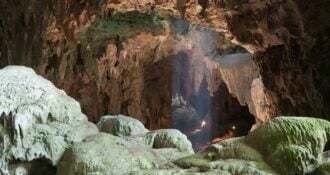 Two papers published in Nature give us a firmer understanding of when these little-known archaic humans (hominins) lived. Location map of Denisova Cave and photo (inset) of cave entrance. Institute of Archaeology and Ethnography of the Siberian Branch of the Russian Academy of Sciences/Bert Roberts, author provided. All fossils of Denisovans and Neanderthals, and hominin bones not assigned to either group, discovered at Denisova Cave. Next to each fossil is the specimen number (for example, Denisova 2 in the top-left corner). Zenobia Jacobs, author provided. But while hominin fossils are few and far between at Denisova Cave, the deposits contain thousands of artifacts made from stone. The upper layers also contain artifacts crafted from other materials, including ornaments made of marble, bone, animal teeth, mammoth ivory and ostrich eggshell. There are also animal and plant remains that bear witness to past environmental conditions. 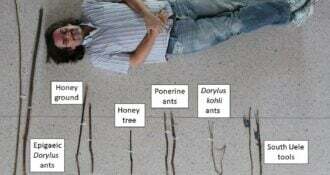 Selection of artifacts from Denisova Cave. a, Upper Palaeolithic; b, Initial Upper Palaeolithic; c, middle Middle Palaeolithic; and d, early Middle Palaeolithic. Institute of Archaeology and Ethnography of the Siberian Branch of the Russian Academy of Sciences, author provided. Sediment profiles (stratigraphy) in Denisova Cave: a, Main Chamber; b, East Chamber. The string lines in each photo are 50 cm apart. Institute of Archaeology and Ethnography of the Siberian Branch of the Russian Academy of Sciences, author provided. Optical dating of sediments: a, Zenobia Jacobs in the red-lit laboratory at the University of Wollongong; b, Sample holder for 100 individual sand-sized grains; b, Sample holders loaded onto carousel for optical dating of individual grains; d, green laser beam used to stimulate quartz grains in optical dating. University of Wollongong/Erich Fisher, author provided. 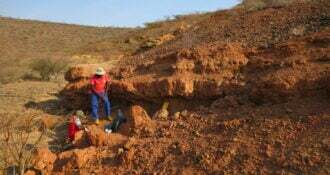 The new studies show that hominins have occupied the site almost continuously through relatively warm and cold periods over the past 300,000 years, leaving behind stone tools and other artifacts in the cave deposits. Summary timeline for the archaeology, hominin fossils and hominin DNA retrieved from the sediments at Denisova Cave. All age ranges are shown at the 95.4% confidence interval. Bert Roberts, author provided.